Facebook just made interacting with timelines, news feeds and tickers a little easier, thanks to a new feature the company is calling "Action Links." The links appear beside the "Like" and "Comment" areas at the base of each update and basically operate as context-sensitive ways of triggering an action that's unique per the app referenced by the update. Take Foursquare, the location-related social network for users on the go: If someone you're following checks into a location that pops in their feed, you'll now see a "Save This Place" link beside the timestamp. Hover over it, and you can either add the app (if you don't already have it), or click it to save the location in your own Foursquare collection. 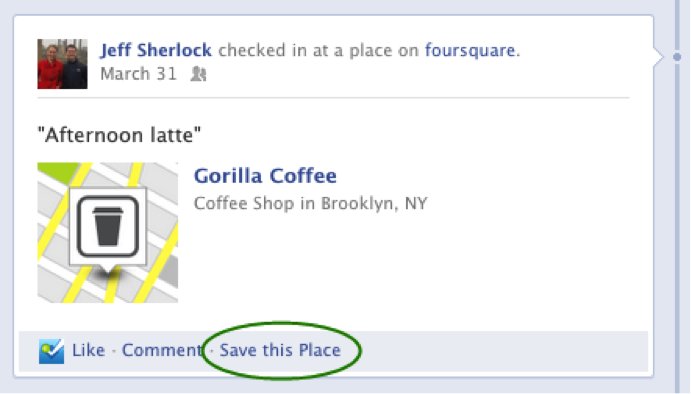 Sure enough, in my feed this morning, I spied someone checking into their office, and the "Save This Place" link added their location to my Foursquare to-do list. Another example demoed by Facebook is Fab.com, a self-styled "design marketplace" that looks like someone jammed Apple and IKEA together. With Action Links, if one of your friends adds a Fab.com product to their list of favorites and opts to publish to their Facebook feed, you'll see it as well as a "Fave this Product" Action Link beside the timestamp. Facebook says developers "can designate an Action Link for any action they define, which will then appear throughout Facebook." Think of Action Links as tying one action to another, in other words, and Facebook notes that they can be part of any Open Graph story. For Facebook users, then, Action Links will seem like subtle, under-the-radar changes, noticed only in certain situations. Since they're app-driven -- the announcement is really a heads-up to app-makers -- functionality right now is just a glimpse of what we'll be able to do in the future. In the meantime, it's easy to confuse preexisting Facebook functionality with Action Links, which is probably the point. Scrolling through recent updates in my feed, for instance, I noticed a friend wishing another friend a happy birthday. Sure enough, just below the picture of a rainbow-colored, frosting-slathered cake was a "See Friendship" link (in the same spot Action Links appear). But the "See Friendship" link, which just shows you how two people have interacted, has been around since 2010. Facebook is just extending feed, timeline and ticker interactivity to developers, in other words. As Facebook feature excitement goes, Action Link seems to be a blip on the radar. However, as developers come up with clever or flat-out convenient Action Link ideas, it stands to make Facebook's Open Graph content that much more essential.